Are Coal Miners Holding a Fire Sale? Fresh on the heels of selling its ADDCAR business, Arch Coal just agreed to divest another non-core operation—is this good business or a fire sale? Arch Coal (NASDAQOTH:ACIIQ) bought a big metallurgical coal business at peak prices, saddling it with debt. Management has been open about the burden in a weak coal market. So far, it has cut its dividend and sold non-core assets. It's not alone in the industry. At what point do managements start cutting bone? The coal industry has been hard hit by oversupply and slack demand. Big players like Arch Coal, Peabody Energy (NYSE:BTU), and Alpha Natural Resources (NASDAQOTH:ANRZQ) have seen their bottom lines turn from black to red. But they aren't the only ones feeling pain, even profitable miners like Cloud Peak Energy (NYSE:CLD) and Alliance Resource Partners (NASDAQ:ARLP) have been retrenching. For Cloud Peak, focused exclusively on the Powder River Basin region, that's meant putting off projects and buying used equipment instead of new. Alliance, meanwhile, is still spending on new projects in its core Illinois Basin market, but has been closing mines in areas where demand has been week—specifically in Central Appalachia. These are the types of things you do when the going gets tough. In the case of these two highly focused miners, such changes have worked well to support profitability. However, not every coal miner is in such good shape. 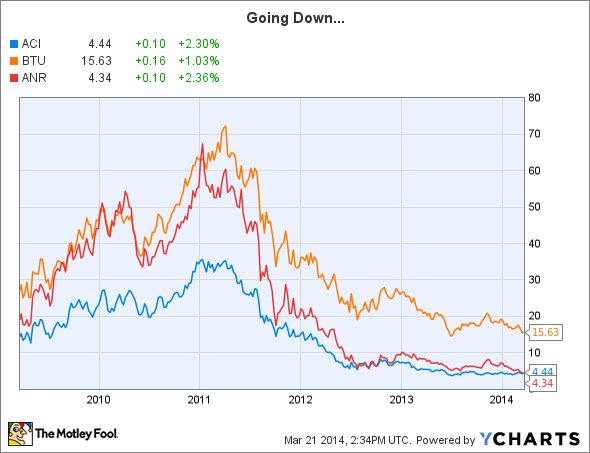 James River Coal (NASDAQOTH:JRCCQ) is, perhaps, suffering through the worst case scenario. After announcing it was looking at strategic alternatives it had to warn investors that it had missed a debt payment and that its auditors were going to issue a going concern notice. In other words, the auditors think James River is going down. All this after closing mines to save money. Although Arch is nowhere near that point, it's still working hard to retrench even though it has around $1 billion of cash on its balance sheet. This has included selling non-core coal mines and other businesses. The two most recent sales were its ADDCAR mining equipment business and its Hazard mining complex. These two transactions, made within a month of each other, only netted Arch around $50 million. While that's more than a drop in the bucket, it's a dribble compared to the over $5 billion in long term debt on the balance sheet at the start of the year. And while having $1 billion in cash provides notable flexibility, you have to wonder if Arch is holding a fire sale at this point. In fact, Arch's moves make the recent sale of natural gas assets by Rhino Resources (NASDAQOTH:RHNO) look pretty good. This coal miner had been expanding into natural gas drilling. However, it just agreed to sell off that business to, effectively, pay off all of its debts. According to Dave Zatezalo, the CEO of Rhino's general partner, the purpose of the move was to give, "...us the flexibility to look for opportunities to expand in both coal and other energy assets." So this relatively tiny miner is setting itself up to take advantage of miners like Arch that need to sell assets to raise cash. But Arch isn't alone, late last year Alpha Natural Resources sold out of its 50/50 natural gas joint venture with Rice Energy (NYSE:RICE). That transaction was unique because it coincided with Rice going public. Alpha got $100 million in cash and $200 million in stock, meaning that it still has upside potential in the gas space but the liquidity of being able to sell stock and not an illiquid asset like a 50% interest in a joint venture. Still, Alpha's move to raise cash is just one more example of a big coal miner selling something to help ensure its survival. The more that happens, the more the industry looks like it's have a fire sale. If you're an investor in the coal sector, you should be a little concerned that good assets will go too cheaply. However, if you want to be on the other side of the bargaining table, you might want to look at Rhino.